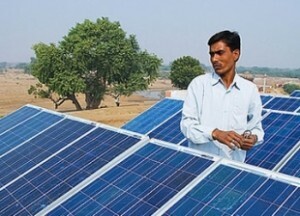 India is set to become the second largest country in terms of solar capacity installed in 2019 with some analysts predicting a massive 15 GW of solar capacity to be installed in 2019, based on the rapid rise in auctioned capacity. India has followed the rule of reverse auctions by state and federal agencies to install solar capacities in which PPAs of 25 years are signed by developers and the government. A large number of developers both foreign and Indian have entered the Indian market and have bid aggressively to tap this large and growing market. Tariffs have gone lower and lower due to the intensity of competition as well as falling prices of solar components. However, many people have questioned the viability of some projects which have been won at super low tariffs. This has already led to consolidation amongst the solar developer community with the top ten players significantly increasing their market share as a number of the small developers exit the market, unable to face the heat of the low tariffs. Despite the consolidation, the problems for the Indian solar developer community has not ended as the buyers which are state distribution utilities have often refused to honor the results of auctions if the prices are not ultra low. Gujarat which is one of the most developed states with a very healthy power sector is one of the guilty states. The state has seen the lowest tariffs given the low risk assigned to the government there. However, the utility there has canceled a reverse auction for the second time as it did not find the tariff in a recent solar auction low enough. Though tariffs came below INR 3/kWh which is quite low, the utility canceled it as the winning tariffs of INR 2.8/kWh quoted by the likes of Fortum and Softbank were not low enough for its liking. The “pick and choose” mentality has made the environment extremely tough for solar developers as they are unable to plan and execute effectively with these ad-hoc decisions. They are already facing troubles due to problems in getting land and transmission and now they also have to face the fickle decision making by the government buyers. Gujarat is now canceling the December auction and plans to come out with another tender increasing the hassle and decreasing the confidence of investors in renewable energy in India. May be you should ask the agency who floated the tender to pay damages to the participating parties.